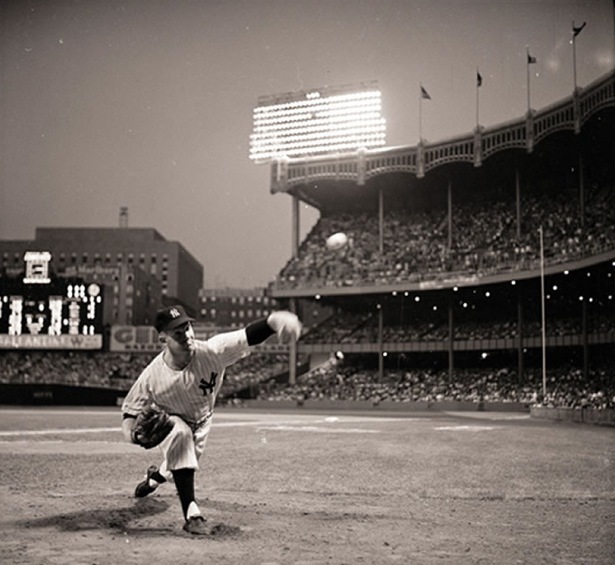 On this day 58 years ago Whitey Ford single-handedly dismantled the Washington Senators in a 19-1 Opening Day rout at Yankee Stadium. The slick lefty baffled the boys from D.C., allowing just 2 hits and 1 run in a complete game victory, but the Chairman of the Board put on a show at the plate as well. In the bottom of the 4th, with the Yanks ahead 2-0, Ford doubled the lead with a 1-out single that scored Phil Rizzuto and Bob Cerv. He struck again an inning later when his single to right field plated Cerv and Hank Bauer. Ford would finish with a 3-for-5 day with 4 RBIs and 2 runs, outhitting and outscoring the hapless Senators by himself. Bill Skowron, Mickey Mantle, and Yogi Berra chipped in with home runs as the Bombers handed Washington its first of 101 losses.